*Offer good on a 2019 Subaru Forester 2.5i (KFB-02) for as low as $189 a month for 36 months. $2999 due at signing. Offers include 1st months payment, plus tax, title and document fees.10k per year. Cannot be combined with any other incentive. Subject to credit approval. No security deposit required. Subject to vehicle insurance and Vehicle availability. See dealer for details Must take delivery from retailer stock by 4/30/2019. *Offer good on a 2019 Subaru Impreza 2.0i 4 door (KLB-01) for $1499 a month for 36 months. $2990 due at signing. Offers include 1st months payment, plus tax, title and document fees.10k per year. Cannot be combined with any other incentive. Subject to credit approval. No security deposit required. Subject to vehicle insurance and Vehicle availability. See dealer for details Must take delivery from retailer stock by 4/30/19. *Offer good on a 2019 Subaru Crosstrek 2.0i (KRB-01) for $189 a month for 36 months. $3499 due at signing Offers include 1 st months payment, plus tax, title and document fees.10k per year. Cannot be combined with any other incentive. Subject to credit approval. No security deposit required. Subject to vehicle insurance and Vehicle availability. See dealer for details Must take delivery from retailer stock by 4/30/19. *Offer good on a 2019 Subaru Legacy. Subject to credit approval. No security deposit required. Subject to vehicle insurance and Vehicle availability. Financing offer term up to 36 or 72 months on select models, with approved credit. See dealer for details Must take delivery from retailer stock by 4/30/2019. *Offer good on a 2019 Subaru WRX Subject to credit approval. No security deposit required. Subject to vehicle insurance and Vehicle availability.Financing offer term up to 72 months on select models, with approved credit. See dealer for details Must take delivery from retailer stock by 4/30/2019. 0% Financing for 72 months is available through Toyota Motor Credit with approved credit in lieu of the factory rebate. APR: 0% for 72 months - $13.88/mo. per $1000 borrowed. All pricing is plus tax, title and $250.00 doc fee. Sale ends 02-04-2019. Model: BU32M2 | Stk# 192826 | 1 available – $0 down low mileage lease offer available through Volkswagen Credit to highly qualified buyers with a credit score of 800 or higher. Tax, title & registration and dealer documentation fee not included. 7,500 miles allowed per year (Excess Mileage Charge is $0.20). Offer ends April 30, 2019. Please contact us for additional details. *Special APR available to highly qualified buyers through Volkswagen Credit inc. Special APR may not be combined with some discounts/incentives. See dealer for additional details. 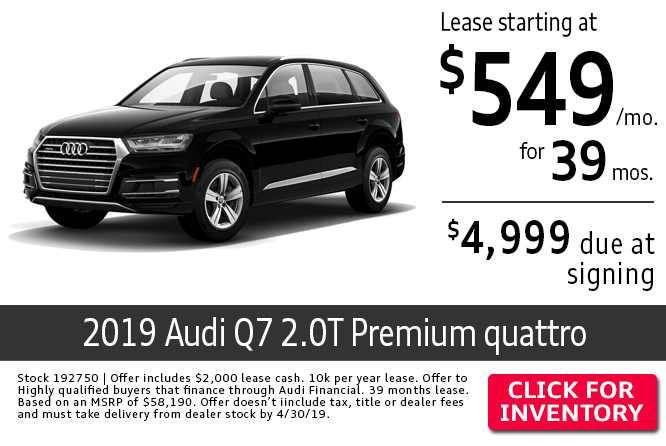 Model: BW22VJ | Stk# 192736 | 1 available – $0 down low mileage lease offer available through Volkswagen Credit to highly qualified buyers with a credit score of 800 or higher. Tax, title & registration and dealer documentation fee not included. 7,500 miles allowed per year (Excess Mileage Charge is $0.20). Offer ends April 30, 2019. Please contact us for additional details. *Special APR available to highly qualified buyers through Volkswagen Credit inc. Special APR may not be combined with some discounts/incentives. See dealer for additional details. 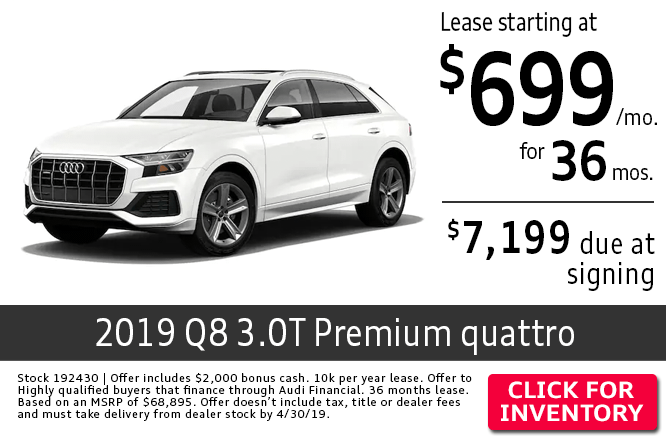 Model: CA1AUR | Stk# 192361 | 1 available – $0 down low mileage lease offer available through Volkswagen Credit to highly qualified buyers with a credit score of 800 or higher. Tax, title & registration and dealer documentation fee not included. 7,500 miles allowed per year (Excess Mileage Charge is $0.20). Offer ends April 30, 2019. Please contact us for additional details. *Special APR available to highly qualified buyers through Volkswagen Credit inc. Special APR may not be combined with some discounts/incentives. See dealer for additional details. Model: A338P6 | Stk# 192733 | 1 available – $0 down low mileage lease offer available through Volkswagen Credit to highly qualified buyers with a credit score of 800 or higher. Tax, title & registration and dealer documentation fee not included. 7,500 miles allowed per year (Excess Mileage Charge is $0.20). Offer ends April 30, 2019. Please contact us for additional details. *Special APR available to highly qualified buyers through Volkswagen Credit inc. Special APR may not be combined with some discounts/incentives. See dealer for additional details. 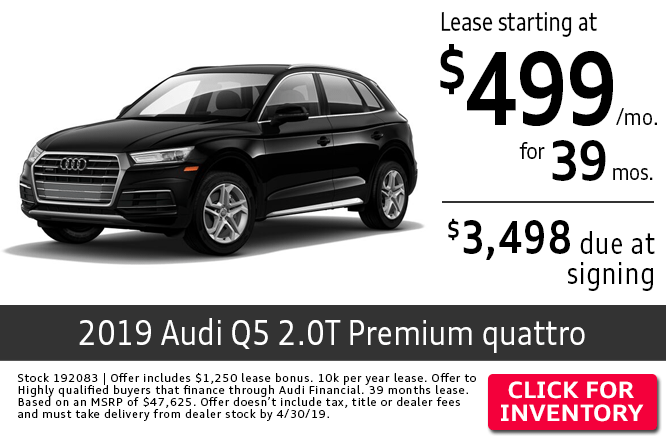 Model: AU21V2 | Stk# 192037 | 1 available – $0 down low mileage lease offer available through Volkswagen Credit to highly qualified buyers with a credit score of 800 or higher. Tax, title & registration and dealer documentation fee not included. 7,500 miles allowed per year (Excess Mileage Charge is $0.20). Offer ends April 30, 2019. Please contact us for additional details. *Special APR available to highly qualified buyers through Volkswagen Credit inc. Special APR may not be combined with some discounts/incentives. See dealer for additional details. *Volkswagen will pay a $500 Loyalty bonus towards the purchase or lease of any new MY19 Volkswagen Beetle or Beetle Convertible. VW Owner is defined as individuals or households possessing current vehicle registration or title of any VW Vehicle 2001 or newer. VIN can only be used once. See dealer for details.